Of the many faces I saw during my week of walking the streets of Calcutta, India 2 1/2 years ago, one pierced deeper and has stayed longer than any other. That week, Kyle and Michelle, our son and new daughter-in-law, were on a mission to expose both sets of their parents to the everyday suffering of the poor of Calcutta, among whom they had been living and serving for several years. So although we parents stayed in a good hotel and ate in upscale restaurants suitable for pampered Americans, we spent several days following them as they threaded through the crowds in the always busy streets, and became acquainted with the people and places that had populated their e-mails and conversations with us over the past few years. Before our trip to Calcutta, I had worked diligently for a number years to see and treat each person I met as an individual of great worth and promise - created in the image of God and worthy of being treated with dignity and respect. But here, the streets seemed filled with so many people who had no place to sleep other than the street, no posessions to carry with them and no food to eat. Each time we stepped out of our hotel we would be immediately approached and followed by people with outstretched palms and murmuring voices asking for rupees. There were so many that they quickly lost their individuality and their name became Beggar. It took no more than two days walking the streets of this city to feel that I, too, had lost my individuality. My name had become Rich Foreigner and my face had been replaced by a dollar sign. 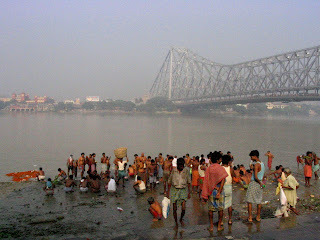 By the time we got to the ferry next to the Howrah bridge on our walking tour that day, we had walked through so many clusters of men, women, and children calling to us, touching us, and asking, asking, asking for money, that the ones who stood out to me were the silent ones. Some risked being trampled as they sat in the dust with upturned palm among a surging crowd in the market and some huddled along the walkways in the subway stations, inches from a puddle of urine, brown heaps of gaunt, folded limbs with deep set eyes so worn down by disease or hunger that they no longer asked, no longer hoped. At the ferry, a young man with a small child in his arms approached our tightly clustered group of 6 with beseeching eyes. He said nothing, but persistently sought our eyes with his. His hair was thick and stiff with layers of dust, his dirty clothes had hunks of material torn away, and he gently held the child with splotchy hair close to his chest. Were they father and son? Brothers? Co-workers? What to do? I had already determined to follow the personal alms-giving policy our son and daughter-in-law had come to after years of anguished living and experimental giving with a tightly knit community of young Americans who lived and volunteered among "the poorest of the poor". They had tried to develop relationships and work on projects that would foster positive, lasting differences in people's lives. In this city where people asked them for money all day long , they had decided to make alms-giving the exception rather than the rule and to do it within the context of a continuing relationship. I rationalized that my time was not long enough nor my heart strong enough to think my way through all the poverty factors and come to a better conclusion, so I borrowed theirs. I averted my eyes from the dry and dusty face of the young man and pulled in my section of the American huddle even tighter. Without making a sound, the dusty young man in torn and dirty clothes held the pantless, silent child close with one arm, and with upturned palm moved in closer to engage our eyes. His eyes asked of each of us the question he did not speak. Like the other parents, I turned my eyes away from him and toward those of my son. He was the tallest in our group, and had lived here by far the longest. I watched his face to see what he would do as the man stood silently in front of him, asking with his eyes. Everything else faded away and time slowed down as I focused on the face of my firstborn child, the one in whom I had invested so very much of my life over the years..
Our son's intense struggle was played out in his pain-filled eyes and in small muscles that twitched around his mouth. Over the past several years Kyle had seen and fed thousands of hungry people in dirty clothes without shoes, had spent his days searching the streets and train stations and streets for the weakest and dying to carry each one back to the Missionaries of Charity's Home for the Dying, had held kerosene lamps while cleaning maggoty wounds, and had raged over destitute people ignored in hospital hallways and dead people abandoned on streets and train tracks. In those slow motion moments the volume of poverty and suffering Kyle had witnessed in this city over the years, coupled with continuing frustration and disappointment over the lack of any lasting difference coming from his efforts, flashed across his face like a war newsreel with mangled bodies, wailing women and dazed children. A merciful heart is a vulnerable thing and and in the face of continuous onslaughts of pain and suffering, most of us choose to protect our hearts by covering them with anger or contempt or obsessive consumption of food, drink, work, activity, or possessions. Kyle is no different. Though he tried to cover his heart with anger as he gave the mute man enough money for a meal for both him and the child, it was too late - the mercy in him had broken his heart once again and shattered like glass across his face. That face - the anguished, shattered-heart face of my first born son - is the face from Calcutta I cannot forget, the one that continues to pierce my heart years later. funny, i don't even remember this happening....it's wierd how the same moment can be experienced and remembered so differently depending on your changing perspective...this probably happened to a lot of other people while i was there too.